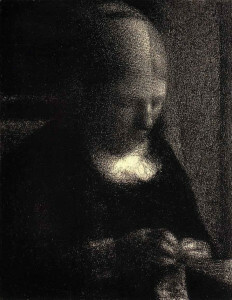 Did Seurat ever meet Vermeer? This Blog was originally posted last December on the NEAC Blog. I was looking at a book of Seurat’s tonal drawings the other day and came across the wonderful drawing he did of his mother stitching her embroidery. The atmosphere of quiet concentration, the self containment, the beautiful subtlety and delicacy of the tonal values and the complete absence of line all reminded me forcibly of another much younger woman also hard at work with her stitching. 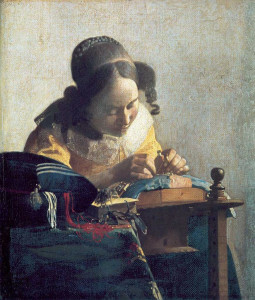 It turns out that the Lacemaker arrived in Paris to take up residence at her current home in the Louvre a few years before Seurat drew his mother in 1882. Piero Della Francesca is the name that more often springs to mind when looking at Seurat’s large paintings and he did spend time studying Piero as a student at the Ecole des Beaux Arts, but I feel sure he stood in front of the Vermeer’s Lacemaker now and again too.